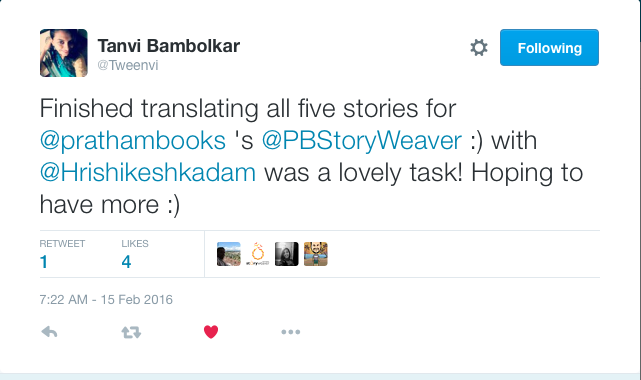 Last year, during the launch of StoryWeaver, we reached out to Guru Baliga at the World Konkani Centre who helped us get Konkani (in Devanagiri script) on to the platform. A few weeks later, we had another Konkani story on thanks to Sujata Noronha (who runs Bookworm, Goa) and her friend Jose Salvador Fernandes. This time, the script was Roman. To us, this was an exciting and hopeful entry into the world of Konkani. More recently, through a grant from The Oracle Giving Initiative we have been able to create 20 STEM titles and make them available in 10 languages under the CC-BY 4.0 license. The 20 stories woven from the Oracle Grant project, they have feet. Feet that are meant to travel the length and breadth of this country and beyond. That’s the dream. That’s our dream for each and every tale that has ever been born. The endeavour to translate these stories in 9 other languages found us connecting with storytellers pan India. We were on the lookout for translators with an inherent understanding of the delicate world of children’s literature. Faced with this mildly daunting task, we turned to the community for support. And they came forward eagerly, to weave these stories with us in many, many languages. 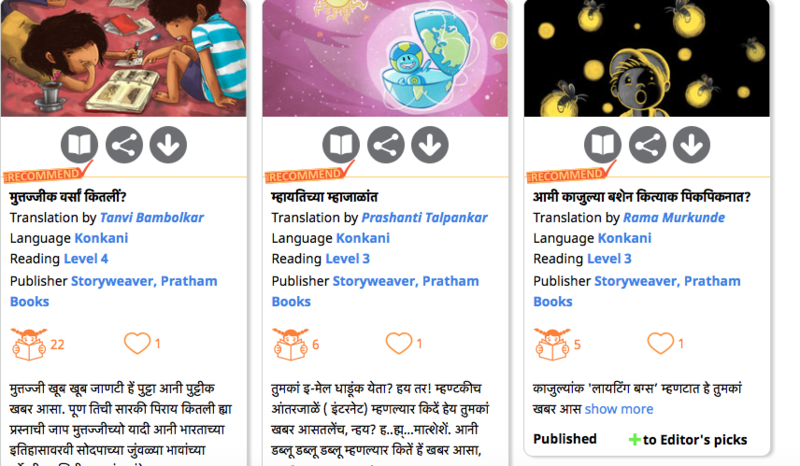 While these stories were being translated and reviewed across languages like Odia, Bengali, Kannada, Marathi…we wanted to hear these stories in Konkani voices too. Finding ourselves at the Konkan shores, we knocked on the doors of our friends at the Konkani Bhasha Mandal (Goa) who responded with enthusiasm and positivity. A couple of mails and some very quick reverts later, our Konkani captain Tanvi Bambolkar hopped on board for our Oracle odyssey. I call her the Konkani Activist. Armed with her energy and the passion of creating more and more stories in a language she strongly feels for, Tanvi and a like-minded Konkani comrade, Hrishikesh Kadam, translated about a dozen odd stories for us. There's a palpable energy and passion in the Konkani community across age-groups which Tanvi explains: "I think the main reason for it is we feel that there is a lot to be done for Konkani and we cannot waste time. So we try to give as much as possible in whatever ways we can." Perhaps this is how they both managed to carve out time while juggling examinations, paper setting and jobs at AIR on the side. And no, they didn’t stop at this. Tanvi introduced us to other Konkani Bhasha Mandal gems - Ms. Ratnamala Divkar and Ms. Kiran Budkuley – who not only ensured that they themselves signed up but also helped us with more leads of other Konkan linguists to collaborate with. Ratna personally spoke to each and every contact on her list, and set the wheels in motion for us. Sunetra Jog lent us her professionalism, Prashanti Talpankar her inimitable child-like enthusiasm; Chetan Acharya his diligence; and Nayana Adarkar’s quiet work ethic saw this dream through. Yogini Acharya, Sandesh Prabhudesai, Rama Murkunde and many more who signed up; we couldn’t have done this without these language stars. We also had stalwarts like Mr. Ramesh Veluskar (Sahitya Academy Award winner) coming in on this project and helping us raise the bar many notches through his wisdom and clarity. This collaboration is the fusion of the old with the new. The younger lot has worked on most of the story translations and their seniors have come in as reviewers for their work to help iron out the seams. As the end credits are about to roll on this chapter, we have names of 15 Konkani enthusiasts (and counting) of the Konkani Bhasha Mandal, Goa who have made this work. This group has a cognisance of the diminishing footprints of their mother tongue from the children literature landscape. They talk of trying to salvage the special subset; the children’s language that is lovingly nurtured within every language of the world. The driver is their intuitive understanding of the lacuna that this loss will leave behind in the collective Indian heritage. They are working tirelessly to populate everlasting Konkani contributions in the field of literature, art, philosophy… so that the coming generations do not lose their sense of belonging. These Konkani stories are a potent mix of zeal tempered with the wisdom of storytelling and the comfort of the language of one’s origin. Sometimes, we walk miles only to be able to come back home. And what a homecoming this has been. More power to our generous and enthusiastic translators, our sparkling community.